Bravo's Make Me A Supermodel casting special showed that a lot of critics of Janice Dickinson Modeling Agency and America's Most Smartest Model were wrong. It is possible to cast a worse looking and less qualified group of "models". I had skimmed through the show first on Tivo to get a feel for what the show was like, but when I played it back to watch it in detail, I realized that something was terribly wrong. Even Janice's rejects are light year's beyond this motley crew. It's like the casting people went to an open call for a local amateur production of "South Pacific" and asked the hopefuls if they would rather be on a TV show instead. Host Tyson Beckford said that the odds of taking someone off the street and making them a supermodel would be like winning the lottery. In this case it's more like the odds of the sun going supernova tomorrow. I can't imagine there will be many people that care who wins this show. Somebody at Tiger Aspect Productions screwed up big time. I give credit to the company for their selection of audition cities. They went to Dallas, Chicago, Miami, Los Angeles, and NYC. Chicago was an especially good choice. There is a lot of good looking men there with a range of European ethnicities. Unfortunately, it looks like the casting people only selected from the actual applicants. If you follow reality TV at all, you know that many of the best characters don't apply on their own; they are recruited. Somebody should went into the Loop at lunchtime and over to Boystown at night and beat the bushes for some really good choices. In Chicago they did find Ronnie Kroell and Igor Galijasevic. Ronnie said that a former boyfriend was an adult video star who had been escorting on the side. Many people have to do two jobs to make ends meet, but Ronnie didn't indicate if the amount of time spent at work contributed to their breakup. In L.A., there was Dominic Prietto and Perry Ullmann. I think they are both good looking, but in Los Angeles of all places, this is all they could find? Why didn't the producers just go the Beverly Center for an hour with a net and capture several seasons worth of qualified wannabes at one time? In Miami there was Frankie Godoy. I don't like men with long hair. End of story. In New York City, Ben DiChiara, the deputy sheriff from Nashville, was discovered. He had been married for four months at the time of his interview. He's only 22 and I think that's too young to be married. People need more time to mature before they make that kind of committment. From all the applicants, 35 were selected to go to the next stage of the audition in New York. There they were interviewed and looked over by the judges. The first cut took out six of them, including Cuban-American Yenier Leyva. That really sucked because he seemed pretty interesting and because all modeling shows need a sexilicious Cuban. The show finally got to bare skin section when the models subjected themselves to be examined wearing only swimsuits. The models took turns doing poses with partner on a chair. Ronnie did a puppy style pose with his hair being pulled back. He said he liked being dominated that way. I just wish he didn't also like furrowing his brow and putting on a fake orange tan. I thought there was something wrong with the tint on my TV until the judges confirmed he was artificially colored. In the end, the field was narrowed down to 12 with 2 more to be selected by the public through an online vote. Dominic, Ronnie, and Perry were selected to be in the twelve, while Igor and Ben were turned over to the whims of whoever stumbled across the web site. The final decision was that the online community selected Ben as the final participant. I think I may watch the show for awhile just to see how Ben fares. His initial photos look pretty hot and I think the public will buy into the newly married, law enforcement backstory. I love Ben! He is my favorite contestant. He is a little young to be married but they have been together since high school (check his bio). I think he is so genuine and I can't wait to watch how he does! Dominic was the ONLY one with model potential. I don't even know why he was on that show. What serious person with model potential would go on these programs? But regardless, he had the best look and was photogenic, even the photographer's comments led to that fact. He doesn't need a 'reality' show to model. 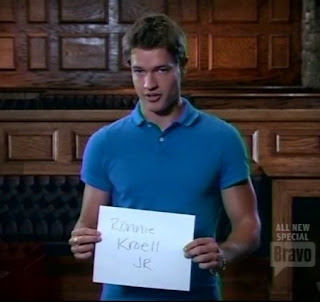 They did him a favor by voting him off, and his exit line was brilliant! You're stupid if you don't think men with long hair are attractive. Fashion models all over Europe have long hair, if you don't like that, then you have no word on fashion. You know NOTHING about it. I don't like long hair on men.